My co-workers always joke that I'm a professional wedding guest. It's sort of true. I go to a LOT of weddings. I think a lot of this stems from the age I am and the fact I've lived in a lot of different places. (I have my friends from growing up, college friends, San Diego friends, and now my San Francisco friends). So while I do find myself traveling often to attend these happy celebrations, I truly do enjoy it. It's a great chance to catch up with old friends, make new ones, and see parts of the country I've never had a chance to experience before. This past weekend, I was a bridesmaid for the fifth time. (My sixth coming up this fall for my friend Erin in Austin!) My friends Kim and John decided to tie the knot in St. Louis. While I had been there in the past for work, being there with people who know the city really made it a memorable trip. One of the other bridesmaids, Tricia, was nice enough to not only grab me from the airport, but also open up her home for me to stay for the weekend. After an *interesting* travel day (ahem...I may have missed my flight and had to book another one), Tricia scooped me up and promptly figured out what to feed me for dinner. (A hungry Jaymee is never a pretty sight). She and her roommate Steven decided I needed to try Imo's, which is sort of a St. Louis institution. Basically, St. Louis-style pizza involves a thin, cracker-like crust (made without yeast), and topped with Provel, which is a type of processed cheese from the St. Louis area and is a blend of provolone, swiss and cheddar. It's cut into small squares instead of wedges ("the square beyond compare"). Basically, it's a magical combination that I enjoyed again cold on Friday night. We also got some toasted raviolis, another St. Louis staple. 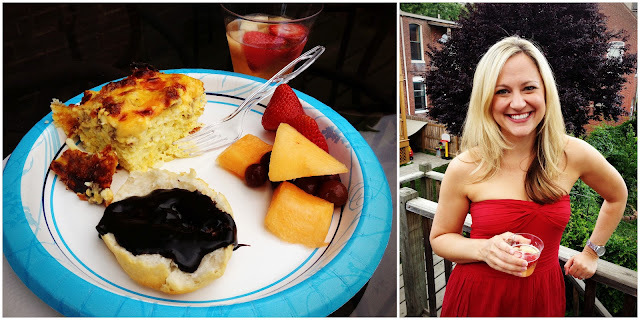 The next morning, Tricia also hosted Kim's bridal brunch. She made two breakfast casseroles (one with peppers, one without). The one without had eggs, sausage, potatoes, and cheese. We proceeded to enjoy it late night the rest of the weekend. Her roommate, who also loves to cook, made this chocolate gravy to top on the biscuits. YES, I SAID CHOCOLATE GRAVY. I didn't even know this existed. I will be getting the recipe and most likely posting on the blog at some point down the road. Later that night it was the rehearsal dinner, which was held at Amsterdam Tavern, a soccer bar that the couple spent many nights at during their stint in St. Louis. It was a perfect location for their laid-back seafood boil. 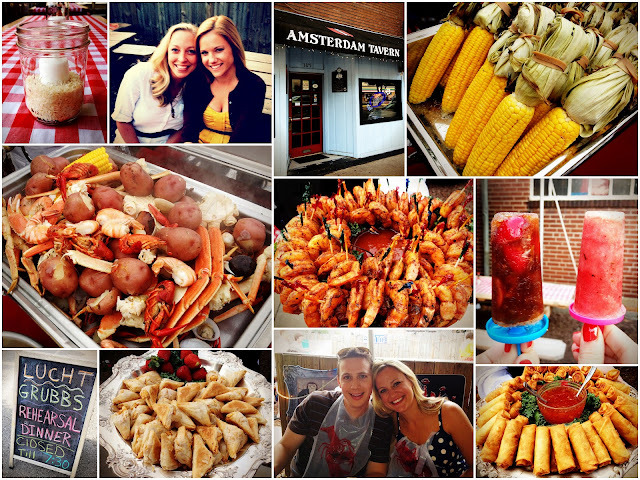 The tables were decorated with checkered tablecloths, and we all proudly donned our lobster bibs and enjoyed the delicious food provided by The Bevo Mill. Onto wedding day! 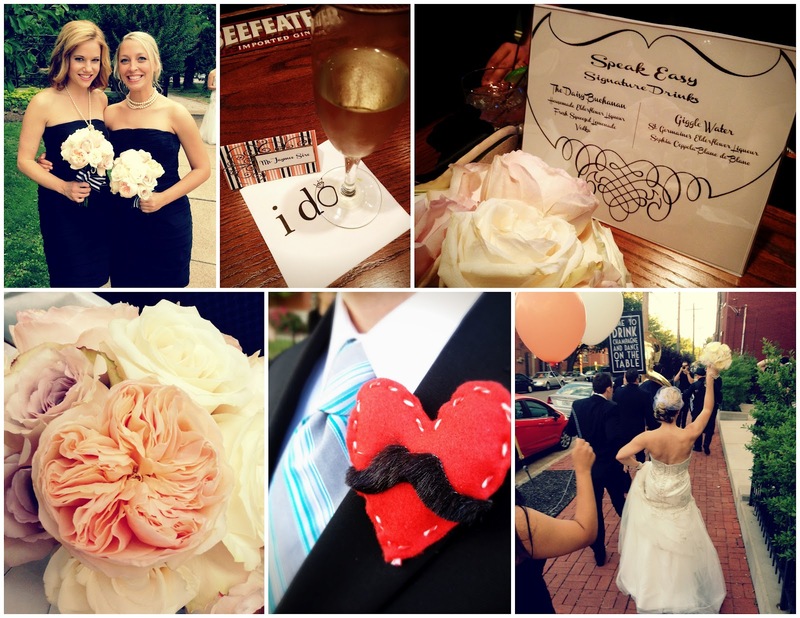 Kim is a wedding planner, so everything was planned expertly. I loved all of the details and how personal it all was at the same time. My favorite part of the day was the "processional" from the church to the reception site. Because her wedding was New Orleans/jazz themed, they had a band lead all of the guests to the reception while everyone carried balloons. It was so festive and fun...I just loved it! I was also a big fan of one of the signature drinks, "Giggle Water," which was Sofia champagne and St. Germaine elderflower liquor. (I may have had a few of these). And because I just can't help myself, I of course snapped photos of the food as well. 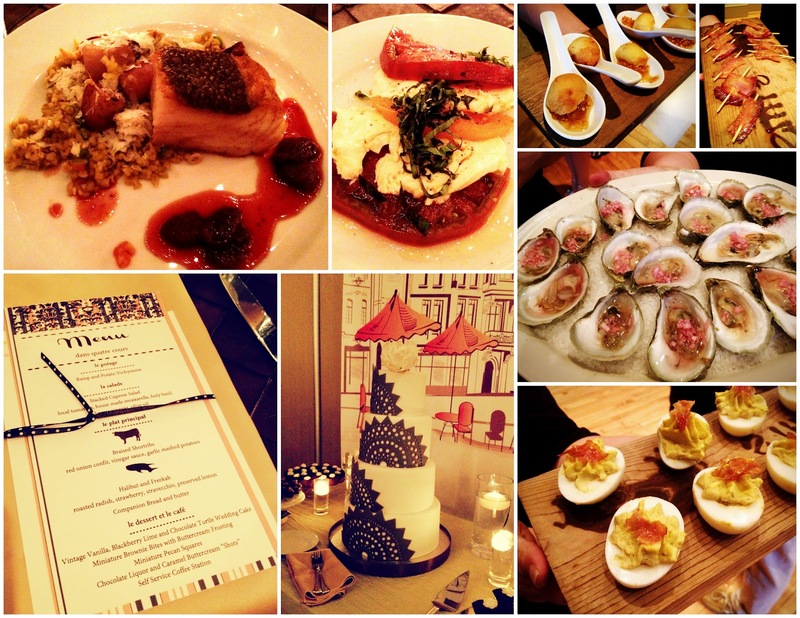 The passed hors d'ouevres included oysters on the half shell, potato puffs, candied bacon (serious), and deviled eggs. All of them were amazing. I probably had 5 deviled eggs and constantly accosted the servers coming out of the kitchen for photos and more food. Dinner was plated and included a soup course, caprese salad, and the main course, which was a choice of halibut or short ribs. Everything was fantastic. Of course, there was the beautiful cake, but there was also 3 other little "bites" to choose from on the dessert table. And if that wasn't enough, everyone got to take some Billy Goat Chips home with them on the way out (another local St. Louis treat). The day-after brunch was held at Rooster in downtown St. Louis. Tricia and I split a version of a "Slinger," which is yet another St. Louis tradition. I'm told this was a "fancier slinger" because it had andouille sausage instead of hamburger and was served at a nicer restaurant in the morning (and not at a late-night diner). It also had white gravy instead of chili, which technically makes it a "Toby" according to Wikipedia. (Oh the things you learn). All slingers come with a fried egg. We made sure to save room for one last bite...the tongue tacos from Neveria La Vallesana. It's located on Cherokee Street, which in my estimation was the smaller version of Mission Street in San Francisco. Sort of funny that I had to go all the way to St. Louis for a tongue taco, but it was really amazing. You kind of have to make yourself forget you are eating a cow's tongue, but once you do, you will be enjoying one of the most tender and flavorful beef tacos you've ever had. After washing it all down with a Mexican Coke, I was finally ready to head back home to San Francisco. Thanks to Kim and John for a fantastic weekend, and best of luck to them in their new life together! Everything looks so amazing! I've been a bridesmaid myself 3 times, and it's always a fun & special experience :)But I really love that Kahlua, Rum, & Coke popsicle idea! I think I've figured out an acceptable alternative...Have you tried making slushies with your ice cream maker yet? A friend and I will be making some boozy slushies this weekend haha and I definitely want to try this combo! This is the fifth or sixth mention of St. Germaine elderflower liquor I've seen in the past few weeks. I guess that's a sign that I need to get some and make some drinks soon!